HAOMEI Aluminum Foil is available in a variety of widths and thicknesses to accommodate just about any task. It withstands high heat and extreme cold, making it perfect for everything from grilling to freezer storage. We supply a variety of different aluminum foil products to meet your various factory and distributors needs. Click on the products below to learn more! Should you require further information about aluminum foil within our catalogue then please do not hesitate to contact us. Confectioners foil is perfect for candy, chocolate and other food items. Food safe foil meets USDA & FDA requirements for direct contact with food and adds appeal while providing a secure seal around the candy or chocolate. Made from food safe foil, like our confectioners foil and pharmaceutical blister foil, food service foil meets USDA & FDA requirements for direct contact with food and is designed to securely and safely wrap a variety of food items. For medical and pharmaceutical containment, as well as other safe seal applications, HAOMEI aluminum Co., Inc. provides heat seal blister foil. This high quality aluminum foil ensures that blister packaged pharmaceutical products such as pills, capsules and tablets are safely secured. Made from high quality aluminum, similar to our candy foil and florists foil, highlighting foil is designed specifically for easy use in the process of highlighting and coloring hair. HAOMEI Aluminium Co., Inc. regularly provides hair foil to salons, beautician academies, beauty suppliers and hair care shops. 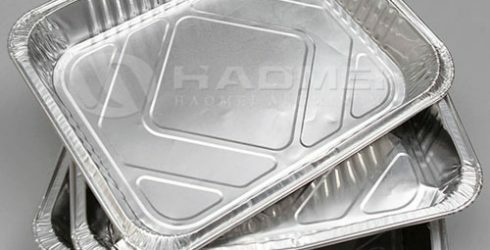 In addition to gift wrap and other flexible packaging, HAOMEI Aluminum Co., Inc. provides high quality paper backed aluminum foil in text and cover weights. 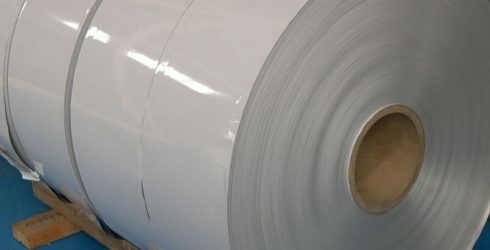 Ideal for printing, packaging and displays, laminated foil paper and board is available in a wide selection of thicknesses and eye-catching colors and patterns, meant to suit just about any display or packaging requirement. Top-coated foil papers are compatible with offset, lithograph and silkscreen printing using oxidizing inks. The applications of Aluminum Foil are quite wide,here we will list all the usage. Aluminium is used for packaging as it is highly malleable: it can be easily converted to thin sheets and folded, rolled or packed. Aluminium foil acts as a total barrier to light and oxygen (which cause fats to oxidise or become rancid), odours and flavours, moistness, and germs, and so it is used broadly in food and pharmaceutical packaging, including long-life packs (aseptic packaging) for drinks and dairy goods, which allows storing without refrigeration. Aluminium foil containers and trays are used to bake pies and to pack takeaway meals, ready snacks and long life pet foods. Aluminium foil is widely sold into the consumer market, often in rolls of 500 mm (20 in) width and several metres in length. It is used for wrapping food in order to preserve it, for example, when storing leftover food in a refrigerator (where it serves the additional purpose of preventing odour exchange), when taking sandwiches on a journey, or when selling some kinds of take-away or fast food. Tex-Mex restaurants in the United States, for example, typically provide take-away burritos wrapped in aluminium foil. 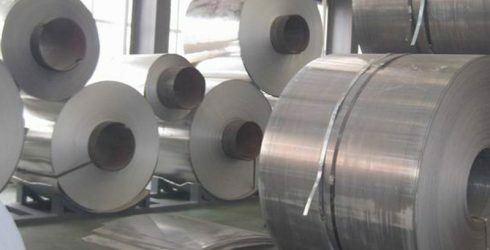 Aluminum foil is widely used for radiation shield (barrier and reflectivity), heat exchangers (heat conduction) and cable liners (barrier and electrical conductivity). Aluminium foil’s heat conductive qualities make it a common accessory in hookah smoking: a sheet of perforated aluminium foil is frequently placed between the coal and the tobacco, allowing the tobacco to be heated without coming into direct contact with the burning coal. 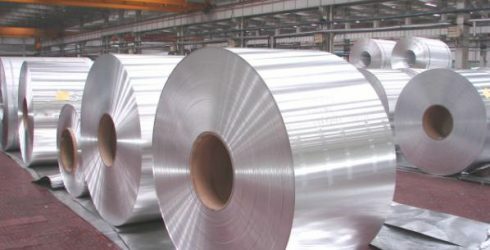 The shielding effectiveness of aluminium foil depends upon the type of incident field (electric, magnetic, or plane wave), the thickness of the foil, and the frequency (which determines the skin depth). Shielding effectiveness is usually broken down into a reflection loss (the energy bounces off the shield rather than penetrates it) and an absorption loss (the energy is dissipated within the shield). Although aluminium is non-magnetic, it is a good conductor, so even a thin sheet reflects almost all of an incident electric wave. At frequencies more than 100 MHz, the electric field is attenuated by more than 80 decibels (dB) (less than 10−8 = 0.00000001 of the power gets through). Thin sheets of aluminium are not very effective at attenuating low-frequency magnetic fields. The shielding effectiveness is dependent upon the skin depth. A field travelling through one skin depth will lose about 63 per cent of its energy (it is attenuated to 1/e = 1/2.718… of its original energy). Thin shields also have internal reflections that reduce the shielding effectiveness. For effective shielding from a magnetic field, the shield should be several skin depths thick. Aluminum foil is about 1 mil (25 µm); a thickness of 10 mils (250 µm) (ten times thicker) offers less than 1 dB of shielding at 1 kHz, about 8 dB at 10 kHz, and about 25 dB at 100 kHz. Aluminium foil is also used for barbecuing more delicate foods, such as mushrooms and vegetables. Using this method, sometimes called a hobo pack, food is wrapped in foil, then placed on the grill, preventing loss of moisture that may result in a less appealing texture. As is the case with all metallic items, aluminium foil reacts to being placed in a microwave oven. This is because of the electromagnetic fields of the microwaves inducing electric currents in the foil and high potentials at the sharp points of the foil sheet; if the potential is sufficiently high, it will cause electric arcing to areas with lower potential, even to the air surrounding the sheet. 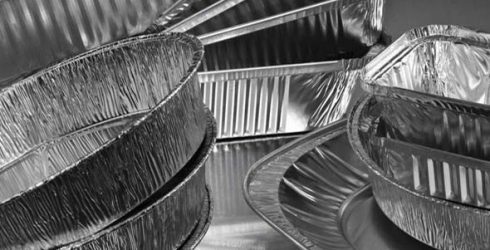 Modern microwave ovens have been designed to prevent damage to the cavity magnetron tube from microwave energy reflection, and aluminium packages designed for microwave heating are available. Heavier foils made of aluminium are used for art, decoration, and crafts, especially in bright metallic colours. Metallic aluminium, normally silvery in colour, can be made to take on other colours through anodisation. Anodising creates an oxide layer on the aluminium surface that can accept coloured dyes or metallic salts, depending on the process used. 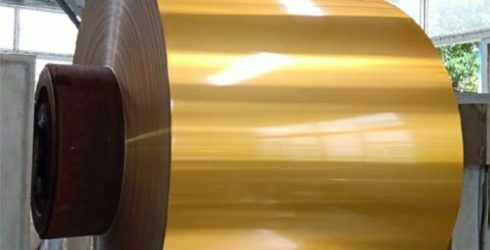 In this way, aluminium is used to create an inexpensive gold foil that actually contains no gold, and many other bright metallic colours. These foils are sometimes used in distinctive packaging. Foil is used by organic/petroleum geochemists for protecting rock samples taken from the fields and in the labs where the sample is subject to biomarker analysis. While plastic or cloth bags are normally used for a geological sampling exercise, cloth bags are permeable and may allow organic solvents or oils (such as oils imparted from the skin) to taint the sample, and traces of the plastics from plastic bags may also taint the sample. Foil provides a seal to the ingress of organic solvents and does not taint the sample. Foil is also used extensively in geochemical laboratories to provide a barrier for the geochemist, and for sample storage. Product description: 8021 aluminum foil is one of our main products. It is the key element used in food packaging and battery jacket. It has good opacity and strong moisture proof & blocking capacity. 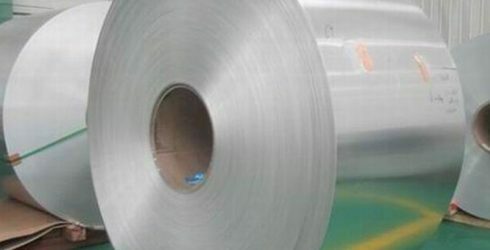 Product description: 5083 aluminum foil available in different material to suit for different products' package. Our product is aluminum foil, Our passion is service. Haomei aluminum is the famous supplier with over 25 countries’ customers. We sell a wide variety of products about aluminum foil. 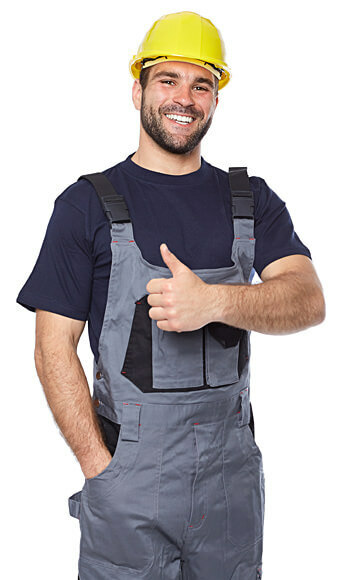 Our staff are highly-specialized and will help you find the product you need. We are aluminum foil experts. Customers choose Haomei aluminum because of our technical products. 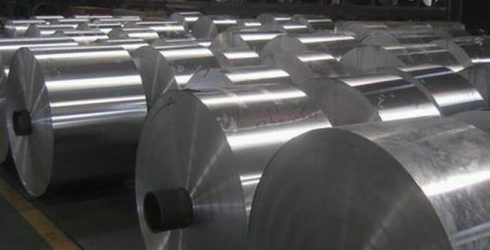 We carry the widest variety of aluminum coil types with good performance. We are conveniently located and offer fast and easy access to products. 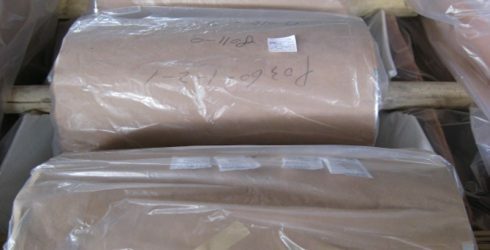 We provide fast, reliable service, packing and deliver, we prepare orders quickly. We are the perfect solution for customers who need aluminum foil fast. No need to wait. Not sure what kind of aluminum foil you need? Our friendly, knowledgeable associates are ready to help. We listen to your needs and provide solutions to your problems. We are committed to total customer satisfaction. After purchase aluminum foil products from Haomei, I realized that they are nice enterprise for the thoughtful service, package and so on, no doubt that we ordered more products in this quarter. The product of us won good reputation, thanks to Haomei, thanks to the staff. I am satisfied with the goods, the packing and the delivery time,thanks for the hard work from Haomei aluminum foil, I will place another order in August. I feel lucky to select Haomei aluminum foil as my supplier, the staff are very responsible, the quality and service give me a surprise, although I am in USA, I will going to visit their factory, I am sure we can have long-term cooperative relationship! With years cooperation, I can say I know Haomei aluminum well, that is exactly why I recommend them to you,Haomei staff provide fast, reliable service and deliver and also the perfect solution for what we need fast.I have visited them several times already, the enthusiasm of all the staff impressed me a lot.